You are going to ( go to ) the park tomorrow morning. 答) Are you going to the park tomorrow morning? Ken is going to Hokkaido next week. 答）When is Ken going to Hokkaido? You will buy the desk at that store. 答）Where will you buy the desk? 答）She is going to eat sushi this weekend. 答）When is she going to eat sushi? 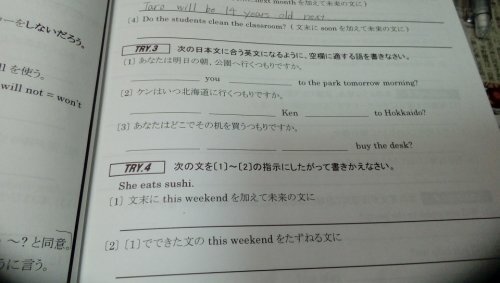 (2) When is she going to eat sushi ?